ESA's ExoMars Trace Gas Orbiter (TGO) carries two Electra radios provided by NASA. 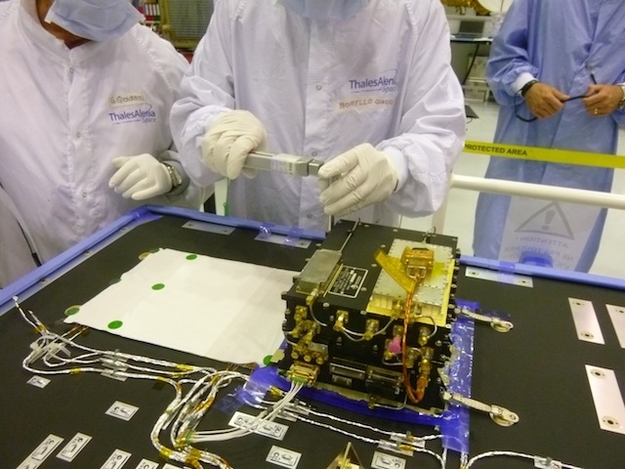 This image shows a step in installation and testing of the first of the two radios, inside a clean room at Thales Alenia Space, in Cannes, France, in June 2014. TGO will study the Martian atmosphere for the presence of methane and other trace gases. It will also deploy the Schiaparelli Mars landing demonstration craft and provide communications support for robotic missions on the surface of Mars. Relay of information from Mars-surface craft to Mars orbiters, then from Mars orbit to Earth, enables receiving much more data from the surface missions than would otherwise be possible. The Electra radio design from NASA's Jet Propulsion Laboratory, Pasadena, California, includes special features for relay use between an orbiter and a rover or stationary lander. For example, it can actively adjust the data rate during a communication session – slower when the orbiter is near the horizon from the surface robot's perspective, faster when it is overhead. NASA's Curiosity Mars rover and Mars Reconnaissance Orbiter already use Electra technology for routine relay of data. NASA's Mars Atmosphere and Volatile Evolution (MAVEN) orbiter also carries an Electra radio.